Ronald Reagan National Airport (DCA) became the latest airport to unveil Checkpoint Evolution today. They introduced passengers to the new uniform , training , and new signage all geared towards making the checkpoint a much more relaxing environment while also enhancing security. We sent Jeremy (best known for his work spinning on our evolution Web site) to Reagan National today to get some photo and video from officers and passengers. Luckily, while Jeremy was on location, there were no sightings of puppies or poultry projectiles. We’re excited to continue to introduce more passengers to the Evolution of Security and I personally can’t wait to fly through DCA again so I can give it a test drive. Phony police uniforms intended to intimidate citizens traveling by air do not enhance security. The only changes that would improve the security kabuki checkpoints would be abolishing the indefensible 3.4-1-1 policy, ending mandatory shoe screenings, and making yelling at citizens traveling by air a firing offense for TSOs. Great job. Now, if you can only stop your TSOs from vitriolic tirades toward the elderly and handicapped that can't move as quickly as the rest of the crowd. That activity doesn't say "Professionalism." You are correct. Next time you observe this, please post a comment with specifics (airport, date, time, airline etc.) and I'll have a customer support manager for that airport look into it. Your comment about the color is a little disingenuous. If your intent is not to intimidate passengers, get rid of the metal badge and shoulder epaulettes. Someone wanted the uniforms to look more like those worn by law enforcement and they do. Part of the reason for that is that people assume a certain degree of authority, which is probably appropriate for the job the screeners are tasked with. As long as that authority is balanced with accountability and responsibility I don't have a problem with that. I think the uniforms look great, and I especially like that they appear to include nametags. I don't mind you wearing a uniform with a badge as long as it includes the nametag. If the TSA didn't intentionally set out to confuse &, most importantly, intimidate the traveling public who doesn't know any better, then why spend all the money spent on the new Kop-style uniforms in the first place? Especially the badges? Even the TSA spokesperson quoted in yesterday's USA Today claimed the badges were supposed to garner 'respect' towards the screeners wearing them. Clearly said spokesperson still doesn't realize that respect is EARNED by deeds & actions, not costume jewelry. There was nothing inherently wrong w/the plain white shirts as long as the screener wearing it took the time to wash, iron, button it up, & tuck it in. Those who couldn't be bothered will still look like slobs in royal blue instead of white. Why are you taking photos/videos of security checkpoints and posting them on the internet? I was told that's against the law and a security breach. Let's say (metophorically) that some group of individuals mean to due American citizens grave harm and let's say that the intelligence services (CIA, FBI, DIA, etc.) get credible actionable information on said threat should the agencies designed to defend and protects us the American citizens ignore this information or should they put policies and procedures into effect to prevent, deter, and defend against said actions. Me personally I would rather my government take proactive protective measures against threats that we have learned are indeed credible than take the reactive steps after the fact. Hey, don't stop yet. You've left off the jump boots, body armor, helmets, night sticks, mace, and Tasers. Might as well go all the way towards completing the garb. So, what do real law enforcement officers think of your uniforms and those nifty tin badges? - Why mandatory shoe removal, instead of secondary screening for those who don´t pass metal detectors and puffers? - Why mandatory liquid limitations in baggies, instead of residue detection? - Why not purchase X-rays that can see through bags to avoid computer removal from luggage? - Why are full body scans analyzed by persons hidden away? - Please explain what is being done to avoid false positives on no-fly and watch lists. - Please explain how ID is going to help avoid flying by dangerous persons, if the TSA is not looking to see if every passenger going through is on these lists. - Please explain why workers and cargo are not inspected. - Please explain why only airline passengers are inspected. Isn´t the TSA also responsible for buses and trains? Didn´t a lot of people die in terrorist attacks on trains? - Please explain the logic of the SSSS boarding pass, easily identifiable by the passenger, who has ample time to prepare for his super search. - Please tell us what you are doing to improve personal relations by TSA officers. Front page article in USA Today on 6/16/08 re: this very subject & nearly 200 posted comments in response to it on their website. In a nutshell, not much. When I look at a police officer in uniform, I don’t feel intimidated. I respect the individual. I respect them until they give me a reason to disrespect them. I realize that there are officers that don’t deserve the respect and I am sorry for that, but it doesn’t mean they should all be looked down upon. There are good cops and bad cops. Good TSOs and bad TSOs. Good teachers and bad teachers… For every profession you have your bad apples. The difference is that our TSOs are extremely visible unlike most professions. We have an extremely professional workforce, and these new uniforms represent the pride that many officers take in their profession. It’s not about intimidation. It’s respect from others as well as self respect. Respect is something both passengers and officers expect and deserve. It’s clear by reading this blog that respect isn’t what everybody always gets. That’s a shame, but to expect a workforce of 45,000 officers and millions of passengers to always play nice will never happen. We can however do our best to make things better by using this blog to communicate with one another. Also our officers have always had visible nametags with serial numbers on them. They will continue to have nametags with the new uniform and their new badges will also be serialized. Agreed that each officer should take pride in their uniform and look professional and presentable. Most do. Those that do not should be counseled by their leadership. There are guidelines on grooming and how uniforms should be worn and I understand this doesn’t happen all the time. As far as the white shirt, I have to disagree. For those officers who have worn the white shirt day after day, week after week, they know that the shirts are dirt magnets. Our officers work with dirty baggage all day long. Everybody has their own opinion on what color the TSA uniform shirt should be, but a high percentage of officers would not pick white. Your sign does not include the exception for Liquids including water, juice, or liquid nutrition or gels for passengers with a disability or medical condition. What part of your inconsistent system should we believe? The signs, a TSO, their supervisor, the website, you bloggers, Kip, or common sense? We could look like Germany’s airport security. Well, I’m sure most “real” officers have more important things to worry about than the TSA’s new badges. At least I hope they do. If a TSO misuses their badge, throw the book at them. They know better… If I were a police officer, I’d be more worried about the many counterfeit badges and credentials that are available via the internet. Anonymous, here are your questions, with answers. I hope you'll forgive me as many of your questions have been answered before. Why mandatory shoe removal, instead of secondary screening for those who don’t pass metal detectors and puffers? To control the amount of liquid transported by any one passenger. We have x-rays that can see through bags, that's not the concern. The concern is what may be hidden below or in the laptop, so in order to get a good look, we ask that laptops be removed. To protect the privacy of passengers. TSA continues to develop the Secure Flight program which we expect will resolve many of the issues. Additionally, we have worked with the airlines to make "interim" fixes until SF is ready next year. We have a responsibility to check these IDs and see it as a serious security function. If your opinion is that it is not, we respect that, but disagree. - Please explain why only airline passengers are inspected. Isn’t the TSA also responsible for buses and trains? Didn’t a lot of people die in terrorist attacks on trains? TSA had a mandate passed by Congress and signed into law by the President on Nov. 19, 2001 that required to forming of TSA and everything that goes with it. We have not received a mandate to require screening of mass transit passengers, some would argue a screening mechanism would take the rapid out of rapid transit. The CAPPS program pre-dates TSA. We are working aggressively to do away with the CAPPS system and install the previously mentioned Secure Flight program. SF would take management and operation of the program from the carriers and put it in the hands of TSA. That way, there will not be as many applications of the program as there are air lines. Going through the new and improved training discussed many times on this blog. "if we wanted to intimidate passengers, I think we would go with a darker color than royal blue." Bob, you have no knowledge of the psychology behind dress/costume. "Well, I’m sure most “real” officers have more important things to worry about than the TSA’s new badges." So, in your world, no "real" leo would worry about the most hated group in government changing their appearence to look like leos. Bob, as long as you are answering questions, will you please address my question regarding the ability to travel of citizens of states that have rejected REAL ID, given that the TSA has proclaimed that it will be policy that only IDs that conform with REAL ID will be accepted as valid. "When I look at a police officer in uniform, I don’t feel intimidated." This isn't about your opinion. It's about that of the average traveler passing through our government checkpoints. Can you honestly tell us that the new uniforms were not designed the way they were to increase the perceived authority of TSA agents? "Also our officers have always had visible nametags with serial numbers on them. They will continue to have nametags with the new uniform and their new badges will also be serialized." Previously, TSA agents had name tags with a very clear purpose: to display a name. Now, their name tags look less like name tags and more like law enforcement officers' badges. Is the name on these new tags/badges more or less readable than that of the old tags? Is the serial number still visible (you only said that they "are serialized")? The only thing on the TSA agent pictured here in your post is the "TSA" on his shoulder. All that is distinguishing about his badge is that it looks like that of a law enforcement officer. "If a TSO misuses their badge, throw the book at them." This just illuminates the complaint people are making here. This is just a name tag -- something that serves to let the public identify a particular TSA agent by name or serial number. How can someoneone misuse a name tag? It seems that these badges (and the new TSA airport security guard uniforms in general) serve no purpose other than to imply more authority than the bearer of that badge actually holds. If you answer no other question that I've asked, please answer this: How has the design, procurement, distribution, and use of these new uniforms contributed to TSA's mission of protecting the nation's transportation systems to ensure freedom of movement for people and commerce? Those are actual federal police officers, and do not staff the hand luggage security area. You're comparing apples to oranges. I just noticed another one gone in an older thread. Is it this blog's policy to silently remove posts? If not why are they disappearing? Again, I thank you in advance for answering this. Please be more specific. What types of comments are disappearing and what post (s) are they disappearing from? I’d like to look into this, but I have no idea where to start without some more specific info. It’s not our policy to delete post once they are approved. However, there have been a few times that I’m aware of when a comment was approved that should not have been. (Did not follow comment policy) We rarely have to do this and hate it when we do. From this point forward, if we have to delete a comment, we’ll leave a note stating what type of post we deleted and why. I have sent a note to the blog team communicating this. Sorry but your answers don't make the cut. Shoes: if they don't set off a metal detector or puffer, what kind of threat can they be? Certainly not more than anything else a person can hide in their body cavities. Putting millions of innocent people through the task of taking them off makes no sense. Liquids: limiting quantity makes no sense. Search for traces of liquid explosives, which can cause harm even in limited quantities. These liquids have to be concentrated, hence they will leave detectable traces. X-rays: if they can't see under my computer, they can't see under a lot of other stuff. Also, why then must I take my computer out of the protective fabric sleeve? Full body scans: either the images are not invasive and can be seen by all or they are and should not be made. At the very least, the screened person must have the right to see the person viewing his/her own body. No-fly lists: I would like to see statistics proving the false positives are down. As long as I keep on being SSSS'd, I won't believe you have fixed them. ID: I am asking how the TSA officer is going to know if the name on the ID is of a person on a list. They do not have the lists with them. You did not answer my question. Workers/cargo: I saw staff walk right through security, last week. They are not inspected. Trains/buses: There are plenty of non-rapid transit trains around. There is no security to go on them. This is also TSA's responsibility. SSSS boarding passes: saying the CAPPS program pre-dates TSA really makes you look bad. Are you saying you are using a bad system for years because you can't change prior policy? Training: You will not get better officers unless you up their basic requirements (schooling, for example) and pay. You need less people with more brains. Look at Israeli officers. They know what they are doing. Intimidate? Did you really say intimidate? Funny, when I think of intimidation, I think of much darker colors such as black. Royal blue just does represent the intidation factor....if TSA wanted to intimidate passengers, they would arm their TSO's. Instead, TSO's are told not to try to restrain passengers who breach security, basically taking away the intimidation factor. The new uniforms are NOT meant to look like police, and in fact they do NOT look like police uniforms of any kind that I've ever seen. So ease up, get on your flight, have a drink and read a book. When you land safely in your destination, you can think about intimidation again, okay anonymous? "Please explain how ID is going to help avoid flying by dangerous persons, if the TSA is not looking to see if every passenger going through is on these lists." "We have a responsibility to check these IDs and see it as a serious security function. If your opinion is that it is not, we respect that, but disagree." Nico, you were NOT asked about the responsibility to check IDs, you were asked to explain how the ID check keeps people on the no-fly list off a plane. You can't explain it and therefore you chose another route: obfuscate and hope you can confuse people - so very typical of the TSA. C'mon people, cops carry guns, TSOs do not. Is it that difficult to figure out the difference? P.S. Cops in some cities were white uniform shirts. Bob, since you are answering questions, is the reason my REAL ID question not being answered is that you are trying to convince your superiors that the question is actually being asked? I know that an older post (I do not recall the title) that got into a discussion of the actions of peoples of different religions had post(s?) disappear. Today I noticed another disappearance in the recent "Day in the Life" article. IIRC trollkiller had promised to "hold your feet to the fire". In their response someone else offered to bring marshmallows. That post is gone. Those are the 2 most specific examples I can offer. Briefly browsing other older posts I came across two other people remarking on posts disappearing. I did not note the article title at the time. Perhaps the blog readers can help. Can anyone give Bob more specific info on any posts that have disappeared? If anyone sees this happen would they please post it to whatever the current thread is? May you never be bothered with kidney stones again. You asked the questions, I answered them. If, in your opinion, they don't make the cut, my apologies. Shoes -- are you asking for body cavity searches? Certainly that would be more invasive than taking off ones shoes. Liquids: Sorry you don't think it makes sense. X-rays: Your assumptions are incorrect. No-fly lists: I don't believe we maintain the data for this, since the remedies are in the hands of the carriers. If we do, I would be happy to find some data points to share. ID: Do they need a list to help them determine if someone is who they say who they are? Workers/cargo: Don't believe everything you see. Lots of screening of employees happens where you wouldn't see it, behind closed doors, in the sterile areas. Trains/buses: I'm not saying we don't have responsibility. If you want screening of passengers on trains, buses, ferries, subways, taxis, and every other public system, please get in touch with your representatives. We do work with all of these entities, but you are right, we don't screen each passenger. SSSS boarding passes: It doesn't make us look bad, it makes us look like we are using a legacy system that has been in place since before we got here. The fact that we are working on revolutionizing the passenger pre-screening system, shows we know we can do better than what is there, and we are working to that end. Training: No disrespect intended, but it sounds like you don't know a lot about our workforce. We do have congressionally-set minimum standards, and believe we have recruited some of the best talent our nation has to offer and far exceeded those standards on average. If you feel differently, that's your right, but I have spent hundreds of hours with many of these people and found them to be committed, intelligent, fun-loving, serious, smart, pleasant, security-minded, aware, patriotic, family-oriented and everything else. Sure, we have some bad apples, but with the former military, law enforcement, school teachers, nurses, doctors, professors, executives and every other former occupation represented in our workforce, I don't believe you can say they need more brains. They need more respect. More waste of taxpayers' money. The TSA should spend their money on new equipment that can detect liquid explosives and walk-through trace detection machines (like the GE EntryScan), not on "window dressing" to make the TSOs look good. Besides, wouldn't dressing them like police officers cause some people to mistake them for actual police officers? If there is a uniform change there should be a good reason for it. You're getting testy, Nico, and you still have not answered the question about how showing ID keeps undesirable people off airplanes. Presenting an ID proves nothing, other than that the person presenting it has been successful in obtaining an ID. "Why are full body scans analyzed by persons hidden away? To protect the privacy of passengers." If the TSA were at all concerned about privacy, there would be no full-body scanners. Sure, we have some bad apples, but with the former military, law enforcement, school teachers, nurses, doctors, professors, executives and every other former occupation represented in our workforce, I don't believe you can say they need more brains. They need more respect. I respect people who leave me alone. I resent people who go through my stuff for no good reason. re: You are correct. Next time you observe this, please post a comment with specifics (airport, date, time, airline etc.) and I'll have a customer support manager for that airport look into it. Bob, why not have the supervisors and managers at the airports do their job in the first place? Fellow TSO's should not permit these behaviors and report these bad apples to their superiors. The fact of the matter is that no one in the TSA chain of command is taking action when these events occur. To many cases of DYWTFT, retalitory secondaries and other tactics causing innocent travelers to miss flights have already occured. TSO's have damaged their status so severely that only time will reverse the negative opinion that much of the public has. The continued introduction of Control Tactics such as requiring one to produce ID if they have it on them or the virtual strip search when no crime has happened harms the image even more so. You can dress up your Make Believe Cops but no respect is due until it hs been demonstrated that respect has been earned. TSO's do not earn automatic provisional respect due to the damage that has already been done by their fellow workers. Their leaders continue to cause even greater damage! Only a change in direction can save this sinking ship. "To control the amount of liquid transported by any one passenger." First, Nico, thanks for finally admitting that TSA is concerned with control, rather than security. So many people at TSA lie to us about so much that this accidental bit of truth-telling is, in a perverse way, appreciated. That said, the liquid policy makes no sense at all and should be abolished. The only liquids that could possibly do any damage to an airplane are so volatile that no one could safely transport them to a taxi, let alone onto an airplane. Sorry doesn't cut it. Abolishing a stupid, pointless policy would. Bob said in part; Well, I’m sure most “real” officers have more important things to worry about than the TSA’s new badges. Bob I am glad that we can agree that TSO's are not "real officers", just glorified baggage screeners. Bob made a comment about a post he would not have approved. I have to question just how a government website, paid with tax payer monies, can infringe on the right of free speech. This is a blatant violan of a protected freedom. Now if this was Bob's personal site I would have no complaint. But this is in fact not a personal site. So my question, has the TSA legal staff reviewed this policy of preventing people from stating opinions that may disagree with the DHS/TSA and Blog Operators are still protected expressions of free speech? I have had several post apparently censored even though I have never used any foul language and have only named the most senior leaders of DHS/TSA that have been mentioned by name in other post. I have made no offensive ethnic comments nor mentioned any racial groups. So why is my constitutional right to free speech being censored from a United States Government website? Anonymous said... "I respect people who leave me alone. I resent people who go through my stuff for no good reason. June 17, 2008 7:30 PM"
So is your saftey "no go reason" is that what you are trying to say? Its like the saying "it is not your driving but the other guys driving you need to worry about"
The only good thing I see coming from this is that maybe more people will start seeing train travel as a viable option. More screening takes more time, and I imagine that if you're going, say, DC-NY/Boston and you seem to get SSSS'd every time Amtrak would probably take the same amount of time (more time moving, less time screening). That or everyone will start taking cars and we can say goodbye to any hope of a greener future. present a fake id while a behavior detection officer is watching your every move, while they are also talking to you and asking questions..... good luck in not acting or looking suspicious. "Please be more specific. What types of comments are disappearing and what post (s) are they disappearing from? I’d like to look into this, but I have no idea where to start without some more specific info." "`Bob' was not saying that x-ray images of an MBA are classified; he is saying that he won't discuss the 'areas on the x-ray that could pique some interest.'" "can't get into specifics of course, but there were a couple of areas on the X-ray that could peak some interest for TSOs"
"I don't think it's a matter of course that you cannot discuss what some laptop computer looks like when viewed by an x-ray machine -- that's hardly classified information. "Could you please explain why this is something you cannot discuss?" "[An image of the insides of the MacBook Air is] not a state secret, it’s sensitive security information. (SSI)"
"It is common knowledge among the workforce that x-ray images are SSI." "Due to the SSI status, the X-ray images can only be viewed by those with a need to know, so the flying public will not be able to see the images." "The reason we can't discuss or show certain things (such as the X-Ray images) is because they are considered `Sensitive Security Information', called SSI for short. "SSI is regulated by federal law, under Title 49, Chapter XII, Part 1520--PROTECTION OF SENSITIVE SECURITY INFORMATION." "We are required by law and regulations to protect information that has been designated SSI. In my office we try to avoid using the designation when possible, in order to ensure the widest possible dissemination, but in many cases that just isn't possible. This appears to be one such case. "Chance - EoS blog team." He cited Title 49, Chapter XII, Part 1520 as the source of his belief that these images are SSI. I thanked him for the prompt follow-up and asked him to specify which paragraphs of the regulation were relevant. In response, he wrote, on March 20, 2008 at 13:04 Pacific (that comment, too, was subsequently removed) that he thought, "paragraphs e-g of 1520.7 may apply to X ray images, especially g." and also cited 49 U.S.C. 40119(b)(1). I quoted those paragraphs, explained my belief that neither they nor 49 U.S.C. 40119(b)(1) was applicable, and asked him what made him think any of them were applicable. Chance has yet to answer my question. "We're going to find an SSI expert to answer your questions. Stay tuned and thanks for posting..."
We're still waiting for that expert answer. Why were Chance's comments (first and second) removed? Should the public have to archive the TSA blog independently in case government minders decide to remove more previously-published comments? I appear unable to get anyone's attention who has any desire or ability to correct an easily corrected problem in your blog notification e-mails. The links provided in your automatic notification system e-mails about new posts in the Evolution of Security TSA blog fail at a 404 page when clicked. PLEASE fix this problem. I have made three reports about this failure via your website comment form, each received a reciept confirmation. It should be simple enough to fix the error in your notification system. 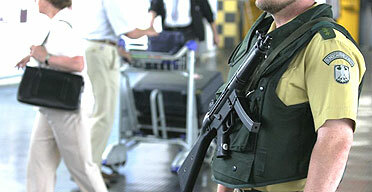 I don't care what the German's airport security looks like. They could all be standing around buck naked for all I care. They aren't Americans. I hold Americans to a higher standard since I am an American who happens to see Potemkin security when I travel. You earn respect. You can't force people who already have a very healthy degree of contempt for TSA to suddenly have respect for an organization that makes a feeble attempt at intimidating the traveling public. Clue, we neither like you, nor trust you, nor respect you. You being TSA. Get your act together and begin mending bridges you've burnt with the traveling public. "I am asking how the TSA officer is going to know if the name on the ID is of a person on a list. They do not have the lists with them. You did not answer my question." "Nico, you were NOT asked about the responsibility to check IDs, you were asked to explain how the ID check keeps people on the no-fly list off a plane. "You can't explain it and therefore you chose another route: obfuscate and hope you can confuse people - so very typical of the TSA." "You asked the questions, I answered them." The OP's request for explanation was poorly worded, but it was sufficiently clear to me that he or she hoped that someone would explain how, given that agents at a government checkpoint will not be looking up the names of passengers who wish to cross that checkpoint in government blacklists, the agents' requirement that travelers present credentials to assist with their identification will improve flight safety. "If, in your opinion, [my answers to your questions] don't make the cut, my apologies." Of course, no one suggested that his answers "didn't make the cut" only that he had yet to answer the question he'd been asked. "ID: Do [our agents] need a list [of names in order] to help them determine if [people are] who they say who they are?" "you still have not answered the question about how showing ID keeps undesirable people off airplanes. "Presenting an ID proves nothing, other than that the person presenting it has been successful in obtaining an ID." Right here on the TSA blog, we have/had a TSO say over and over again that you needed a doctor's note or prescription to get any medication through a TSA checkpoint. When several of us pointed that out and asked for you or Nico or Kip or anyone else to correct this TSO, you sat by and said nothing. And that TSO continued for some time to spew that nonsense that taking Advil or Allegra through security without written documentation from a doctor or pharmacy was a big no-no. If you won't initiate simple clarification when a TSO (or anyone else for that matter) misquotes or misinterprets TSA rules on this blog, what hope do I have that you will do anything regarding unprofessional treatment I get at the airport? My reply was along the lines of "I have the marshmallows, who has the sticks" (paraphrase). Both what I wrote and what the TSO wrote were jokes. No one in their right mind would think anyone would roast marshmallows over the TSA or even a single TSA employee. That was me again. In that case I have no problem with the posts disappearing. The post I responded to attacked a particular religion, my post defended that religion by comparing it to another world wide religion. BOTH posts were not appropiate for this site and against the stated rules. Fogive the misspellings, I have already shut down my spell checker... time to head to the house. Thank you for at least attempting to address our concerns, writing out answers (but not answering!) many of our questions. As a Scientist, it bothers me that all your policies are put in place with no solid studies to back them. A perfect example is when you say the numbers of false positives on no-fly lists are going down, and then when I ask for these numbers, you state they are not in TSA´s hands. This is stuff the TSA should be monitoring closely. It is also stuff you should show the public. You want us on your side! I have never seen any studies I would accept in a scientific meeting or journal coming from the TSA to support their policies. In other words, you put millions of people through hell and waste millions of dollars with no need to show what you do works. Making everyone take off their shoes, for example, is akin to preventively removing everyones appendix, because it may get infected some day. The cost is just not worth it. If the "evolution of security" continues in this line, I am very concerned about where it will be in a few years. Hopefully someone with a little more understanding of Science than W will be in office soon and change things around. And please, we understand that that TSOs are not LEOs. Still, despite any denials, you are dressing them to look like LEOs. "Can you honestly tell us that the new uniforms were not designed the way they were to increase the perceived authority of TSA agents?" In another post someone started to tell us about the decision process. They then told us they were sillenced, unable to give us that information. "present a fake id while a behavior detection officer is watching your every move, while they are also talking to you and asking questions..... good luck in not acting or looking suspicious." Of course, each of the 9/11 hijackers had valied, state-issued ID. Why doesn't TSA implement some policies that would have prevented the last hijacking instead of wasting our time with nonsense from the feeble mind of Kip Hawley?